Today we start a new series: Blog Spotlight. We put together a short list of excellent but somewhat overlooked blog that deserves a greater audience. Expect to see a post from a different featured blogger here every Tuesday and Thursday evening, around 7pm. 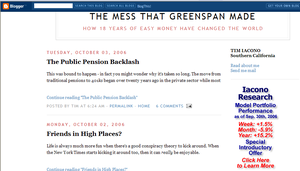 First up in our Blogger Spotlight: Tim Iacono and The Mess That Greenspan Made. Tim is a software engineer in his mid-forties, living in Southern California. He calls his blog is a "vain attempt to stave off a mid-life crisis, and here's hoping that it's going to work." Today's focus commentary is called Friends in High Places? and it address the controversey we discussed last week. Life is always much more fun when there's a good conspiracy theory to kick around. When the New York Times starts kicking it around too, then it can really be enjoyable. Such is the case with the recent plunge in the price paid for gasoline by formerly dour consumers leading up to an election where the party in power is clearly having difficulty wooing the electorate. 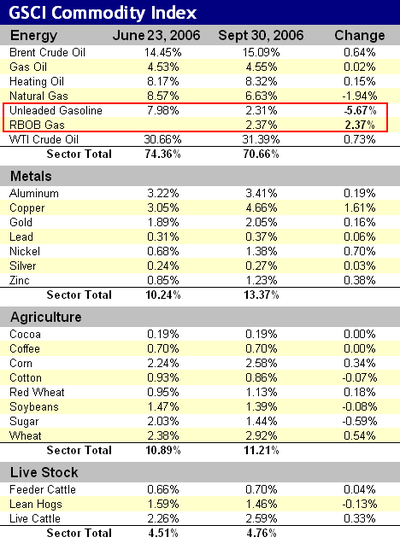 It just so happens that the newly appointed Treasury Secretary used to run the investment bank that controls the world's most important commodity index, which seven weeks ago cut the weighting of unleaded gasoline by nearly 75 percent, causing all commodity investments based on this index to sell their unleaded gasoline futures. For the same number of buyers, a glut of sellers means lower prices, and voila! Prices at the pump drop precipitously, consumer confidence rebounds, and the electorate develops a new spring in their step. Or at least, that's what some would have you believe. . .
A recent poll revealed that 42 percent of the respondents thought the White House had somehow manipulated the price of gasoline so that it would decrease before this fall's elections. They were only slightly outnumbered by the 53 percent who believed there to be no trickery involved. Wholesale prices for New York Harbor unleaded gasoline, the major gasoline contract traded on the New York Mercantile Exchange, dropped 18 cents a gallon on Aug. 10, to $1.9889 a gallon, a decline of more than 8 percent, and they have dropped further since then. In New York on Friday, gasoline futures for October delivery rose 4.81 cents, or 3.2 percent, to $1.5492 a gallon. Prices have fallen 9.4 percent this year. The August announcement by Goldman Sachs caught some traders by surprise. The firm said in early June that it planned to roll its positions in the harbor contract into another futures contract, the reformulated gasoline blendstock, which is replacing the harbor contract at the end of the year because of changes to laws about gasoline additives. Later in June, Goldman said it had rolled a third of its gasoline holdings into the reformulated contracts but would make further announcements as to whether the remainder would be rolled over. Then in August, the bank said it would not roll over any more positions into gasoline and would redistribute the weighting into other petroleum products. Not surprisingly, Goldman Sachs had no comment on the recent change. Having looked at this commodity index some time ago as part of the work done for the Iacono Research website, the weightings from late June were already available in spreadsheet form. A comparison between the composition from a few months ago to the most recent data available at the GSCI page of Goldman's website shows the following changes. 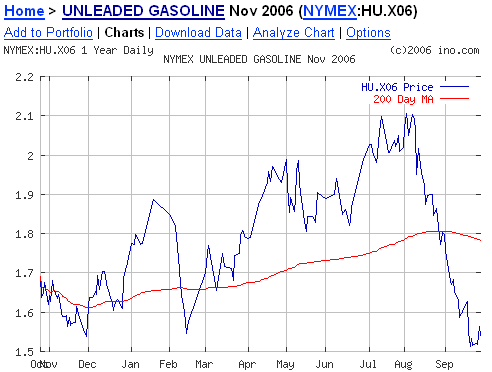 The Times article states that the adjustment prompted the sell-off of some $6 billion in unleaded gasoline futures contracts, some of these being replaced by Reformulated Gasoline Blendstock for Oxygen Blending ("RBOB") futures and, as shown in the chart above, the rest being distributed to other commodities. Note that there was a hefty decline in the natural gas weighting as well. There have been many other factors at work contributing to plunging energy prices over the last two months - the calming of tensions in the Middle East, a mild hurricane season, and improving energy production around the world - but the August 9th date serves as the peak for nearly all energy products. 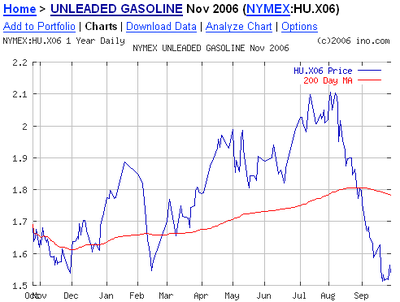 The plunge of unleaded gasoline prices around this time is clear in the chart below. So, indulging some conspiratorial inklings just a bit further, a reasonable question to ask is whether there might be a relationship between falling gasoline prices and other energy prices. Were plunging gasoline prices just part of a broad energy price deline or did it serve as a catalyst? The price of heating oil, for example is often affected by the price of crude oil, and gasoline prices can impact how much traders will pay for other commodities. As it turns out, the end of the first week in August marks a peak for almost all energy commodities - crude oil, heating oil, gasoline, and more. 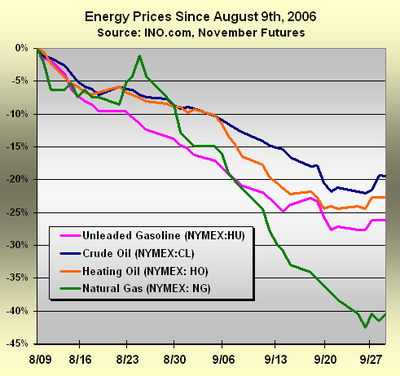 But one look at the chart below and it becomes clear which energy commodity led the others down. With the exception of a brief exchange with always-volatile natural gas shortly after August 9th, other energy prices appear to have been led down by the falling price of unleaded gasoline. It looks like a contagion in the graphic above, spread by unleaded gasoline and picked up by other energy commodities that were unable to fight off its effects. Not until ten days before Aramanth Advisors fessed up to their bad energy bets on the weekend of September 17th and 18th did the plunge in natural gas prices surpass that of unleaded gas. Of course, owning near ten percent of all natural gas contracts just prior to that fateful weekend, the actions of Aramanth traders leading up to their confessional likely exacerbated this decline. So, as far as conspiracy theories go, this is quite a good one. The motivation for the commodity index change and the impact on other energy prices will likely never be confirmed or corroborated, but it makes for an interesting story. Make a little change that causes $6 billion in unleaded gasoline futures to be dumped onto the NYMEX, then watch prices tumble. Stand clear, watching for traders like Aramanth to implode, and get ready to mop up any other messes that arise during the process - all to relieve a little pain at the pump, prior to the polls opening. Some at the White House may be patting themselves on the back figuring that the best thing they've done in years was to get Hank Paulson to take the job at Treasury. It's good to have friends in high places.